When training camps rolled around in the middle of September, defenseman Steve Staios found himself in a very unfamiliar situation. For the first time in his 15 year NHL career, he didn't have a contract. While many players have a hard time accepting the inevitable fate near the end of their careers, Staios has embraced it. He agreed to come to camp with the New York Islanders on a try-out basis. The Islanders dressed a much more veteran line-up on Saturday night against the Devils than the night prior in Boston, and it paid off in a big fashion as the Islanders defeated their Atlantic Division rivals 6-2. The story of the game was Mark Streit. Playing his first NHL game since April 2010 after missing all of last season with a severe shoulder injury, the defenseman lead the Islanders to a win with a goal and two assists. His performance earned him the first star of the game. The Islanders won this game thanks to their power-play, one that struggled at times last season with Streit absent. The defensive effort was pretty good too, despite the Devils resting many of their regulars. Streit made some good break ups, and did it all cleanly. The return of the newly named captain will provide a good jolt to the defensive unit. As far as the forwards go, John Tavares, Frans Nielsen and Michael Grabner all looked like their normal selves. 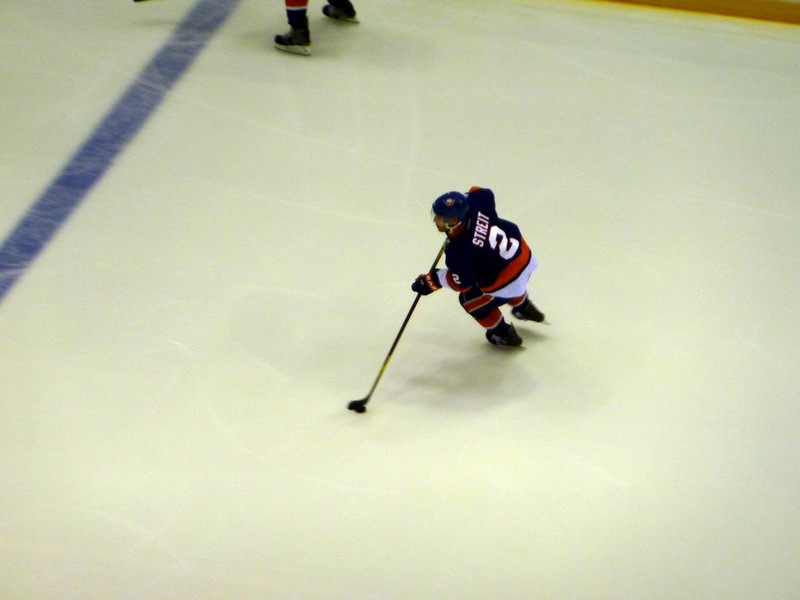 Grabner used his speed to create fast breaks. Tavares looked like he worked on his skating a bit and made some really nice passes. Nielsen and Tavares, along with Matt Moulson all were on the same powerplay line that created some nice chances and a couple of goals to boot. Nielsen told me after the game that while the effort was good, their timing is a bit off but that's why they play preseason games. To be honest, if their timing was off it was only by a little bit. It's great that with a limited preseason schedule, they are already at that level. The offense will definitely be fun to watch again this season. Al Montoya got the start and was replaced in the middle of the 2nd period by Kevin Poulin. Poulin looked the better of the two, but they each had a couple of missteps here and there that didn't really cost the Islanders. But, we'd have to see that improve because those mistakes will be cashed in by the likes of the Sidney Crosby's and Ilya Kovalchuk's of the division. Montoya had to scramble a couple of times, perhaps from going down too soon. But this is when a goalie works on their timing, and the fact that both made it work out despite making an occasional mistake here and there is a good way to start. Defensively, the effort was good too. Mark Eaton got caught a couple of times, but he played in his first game since December. Travis Hamonic had a strong showing, and looked even better on offense than last season. He'll obviously look to take on a more offensive role this season as he'll likely be on one of the powerplay units and may even be on the first pairing with Streit. Good to see him start off on a good note. Other guys who impressed me on defense are Steve Staios and Aaron Ness. Staios was very steady, and made up a good pairing with Streit. It allowed Streit to play his game as the two were good compliments to one another. At this point, something would have to go terribly wrong for Staios to not get a contract from the team. Ness showed good speed, and played his usual high risk game. However, he was very sure not to get caught out of position and used that speed to get back if need be. He's fast enough that he was able to spring ahead of an opposing forward before turning around to skate backwards and get into defense mode. There is definitely some workable talent there, and he'll have a chance to do great things in Bridgeport this season with Mark Katic likely out for the year. The Isles have a couple of days off now before their game against the Calgary Flames, on Tuesday night. The New Jersey Devils, coming off of a 4-3 preseason loss to the New York Rangers arrive at the Nassau Coliseum to take on the Islanders. It's the Isles only true home preseason game on the Island. Pandolfo appears to get a bit of an upgrade in linemates, and for good reason. His showing on Friday night with Trevor Frischmon and Jeremy Colliton (until the latter left with an injury) was pretty strong and warrants more of a look. Steve Staios, who wore an 'A' on his jersey Friday night in Boston returns to action as Mark Streit's partner on the top pairing. Thats another guy to keep an eye on. Ryan Strome will be playing his first professional game (sort of, I guess) against a decent NHL line-up. We've seen already what he can do against other prospects both in the orgianization and abroad, but now we'll get to see him against NHL players. He's hoping to stick, even if it's only for nine games. A strong performance Saturday night can go a long way in helping him make the case for that. BLOOD DRIVE: The Islanders and the American Red Cross are teaming up for a blood drive before the game. Fans who wish to participate can donate blood at any time from 12 noon up until game time at the Coliseum. There is an effort to help replenish the blood supply, which is rather depleted. According to the Red Cross, Hurricane Irene cancelled close to 150 blood drives, causing this sudden drop in levels across blood banks. It's always good to help out those in need, and this is no different. If you are able to do so, it's highly encouraged that you participate. The first 200 people who participate will receive two vouchers to a future Isles home game. Those who donate and are also attending Saturday night's preseason game will be entered into a raffle to "high five" the players as they come out to the ice. For more info, check out the Isles press release on the blood drive and remember to do a good deed that can go a long way for others. The Islanders finally got their preseason schedule underway Friday night in Boston, falling 6-3 to the defending champion Boston Bruins. What you really need to know for the game? Trevor Frischmon and Jay Pandolfo got significant minutes. So for those lamenting the final score and slagging on anything you can possibly think of, my recommendation is you tone it down - especially in the preseason. Save it for when the real thing starts. The only thing I can really gripe about, in my opinion, is the play of Josh Bailey and Blake Comeau. Neither of them looked particularly great, and the floated a lot. The only thing I will say for Bailey is that he was good on faceoffs. If he can keep that up, it can only help as gaining control of the puck can help him put more points on the board. It seems that every season preview done on the Isles, Bailey is listed as a wild card or a player to watch. He needs to step up a bit from what he's done in past years. Guys like P.A. Parenteau I wasn't worried about, and he looked fine once again. He did a good job to carry the puck into the zone, and use his speed to try and force defensemen to the wall. I know earlier I made the crack about Frischmon and Pandolfo, but I'd like to give credit where credit is due. Both looked fantastic on the forecheck and Frischmon was able to add a goal. Dylan Reese looked good too, putting a couple of pucks past Tim Thomas. He reminded us why he's a good option to have as one of the top guys down in Bridgeport and for depth up at the NHL level. He's not afraid to pinch and can play a two-way game. Ty Wishart on the other hand didn't look too good, and it goes beyond him fanning and falling on that gift wrapped one-time opportunity. He seemed out of place at times and scrambling to get back into position. He was knocked down a couple of times by smaller players. That shouldn't be happening too much when you're 6'4". The real story of the night, however, from the Islanders side was Rick DiPietro. After proclaiming that he finally feels healthy after going through the offseason with no surgery, DiPietro played his first game and actually looked pretty good. His side-to-side movements were quicker than in past years and going down into the butterfly and getting back up didn't seem to be much of a struggle. It's still a tad off, but the hope now is he'll get some of that timing back in preseason and go from there. Very solid effort. One more note: Justin DiBenedetto is a solid, hard working kid but with a reckless game at times. We saw why Friday night with the game a blowout. He went after David Krejci, who said after the game he was not pleased with DiBenedetto's actions. I would agree - Krejci's hit was clean in my opinion. For DiBenedetto, who's been described as an agitator of sorts, it is his style and what he does. But there comes a time where he needs to tone it down a bit. The team knows what he can provide, and we saw it last season. There was no need for him to do it, to impress the staff or for any other matter. He'll serve an automatic one game suspension for getting a checking from behind game misconduct. The Isles next game is Saturday night at home against the New Jersey Devils. Since I didn't get to go to media day last season, I wasn't going to bypass the chance to go this year. But little did I know that this one would be more busy than others in the past. On Tuesday night, the news broke that the Islanders plannned to announce the new captain and rumors spread about who it could possibly be. Smart on them for making the announcement when anyone in the media who mattered was standing there before them. Mark Streit was the best and most logical choice for captain at this time. Many folks, myself included, thought for sure that Tavares signing his extension would also bring on the 'C' but we were wrong, and believe me at this time that is a good thing. Tavares just turned 21 on Tuesday. Streit has been a captain for the Swiss national team, so this isn't anything new to him. He's been a part of the Islanders leadership structure since signing his five year deal back in 2008, so you could see this coming. He's got two years left on the deal, and that should give ample time for any of the kids to properly develop and hopefully go on some nice playoff runs prior to getting their crack at it. Streit is obviously looking forward to the challenge, and with good reason. Can you imagine being the team captain and taking a team like this one back into the playoffs? Can you imagine doing that after missing an entire season with a shoulder injury? It would make it that much sweeter. It remains to be seen who will be named the alternate captains, and Head Coach Jack Capuano said he and Garth Snow hadn't talked about that yet. They'll go with rotating ones throughout the pre-season though and go from there. Aside from that, it was a nice day of watching the team go through their drills. One thing I quickly picked up on was how much less vocal Capuano is than Gordon. That's not a good or bad thing, just an observation. Capuano's drills did seem to be a little more of a 'hands off' approach and werent interrupted as many times as Gordon's were. But if guys messed up on a play and laughed about it, Capuano did remind them to get back in line and get ready to try again. We've seen how well the team responded to Capuano at the end of last season, so lets hope it resumes from the beginning of camp. The goalies looked pretty good. Rick DiPietro's side-to-side movements were faster than in years prior, and there was virtually no odd moments of stretching during down time. That was a pretty frequent occurrence last season. However, the Islanders are taking their time with DiPietro. All three goalies in the first group (Al Montoya and Mikko Koskinen the others) rotated on a fairly regular basis. Meanwhile, group two saw Evgeni Nabokov get most of the time in net (while Kevin Poulin and Andres Nilsson generally split time). When you think about where both of these guys are, this makes sense. Nabokov has stated many times he's using the camp to get into game shape the fastest way possible, and the Isles seem to be trying to accommodate that. I was pretty impressed with Nabokov's glove hand as he made three or four real nice snatches out of the air. If he can get back to the level he was at not too long ago, we might have something fun to watch. The line of Tavares, Matt Moulson and Nino Niederreiter looked pretty impressive to me. The three of them compliment each other so well. Tavares looks to have improved his skating yet again. Don't forget the fact that he now has nothing weighing on his shoulders for the next several years after signing the long-term extension. He has nothing to worry about now but on-ice performance and within the first few days of camp, he's showing even more improvement. I'm really hoping Milan Jurcina can stay healthy for much of the year. Jurcina really impressed me last season, and I really liked how effective he was particularly on the PK. He looked really strong during some of the defensive drills. It's great that he's healthy right now, but will that last? Groin injuries seem to have been the only things that can slow him down, so if the Isles new health philosophy changes that we'll have some solid play to look forward to there. As I mentioned, it was the first time I got to participate in media day but the event was an enjoyable experience. I viewed it as the "kick-off" of sorts for the season, even though the team had been at it for a couple of days already. There is certainly a different feel surrounding the team, and Jack Capuano looks like a man who means business. I don't want to say he seemed really laid back last season, but he has a much different feel going into his first full season as head coach. He'll still be a players coach and still fool around here and there, but it seems there are more levels of seriousness now with a clean slate for all. In all honesty, Charles Wang and Snow didn't tell us anything we didnt already know. A reporter asked Wang a question about the announced proposal from ABLI that came down yesterday just before the press conference started, but he refused to comment. I can't blame him since he likely hadn't seen all the details yet. But more on this news in another post. It was a nice day put together by the Isles, to get all the media under one roof and give us the opportunity to get lots of good coverage just prior to preseason games being played. The Isles first one is in Boston on Friday night at 7 PM. I got to speak after practice with Travis Hamonic and Islander hopefuls Jay Pandolfo and Steve Staios. Look for posts surrounding those individuals over the next few days as well. For a photo gallery from Wednesday, be sure to check out this link. John Tavares to Sign Six Year Extension; Captaincy Next? No matter how many times he repeated himself people just didn't want to listen. Time and time again, John Tavares has repeatedly stated how much he wanted to be a member of the New York Islanders and how he was in it for the long haul. The most recent comments came last week during the ESPN media tour. But people were still skeptical, still scoffed and still looked at the situation from their own point of view rather than from the players. This is a rare player in the sports world today - one who was drafted by what was a miserable team at the time, one who vowed from that moment that he wanted to be "the guy" to turn them around and the one who is so far standing by his commitment. When all is said and done, Tavares will have himself a new six year, $33 million extension in addition to the year remaining on his entry level contract. It's a fantastic deal for all involved. For Tavares, he gets to head into a crucial season for the team and not have the whispers surrounding his future with the team. He can play with a clear head. For the Islanders, they get their franchise player signed for a very nice $5.5 million a season, hardly a back breaker when it comes to building a team. The term is also perfect, since we've seen time and time again what can happen with super-long term contracts both first hand (Rick DiPietro and Alexei Yashin) and abroad (Mike Richards and Jeff Carter). Tavares also gives himself a chance to earn more money in the prime of his career as he progresses towards his potential. The press conference to make all of this official will be Thursday afternoon at 1 PM. But will there be more of an announcement than just the signing of an extension? Many have speculated on the idea that Tavares could also be named the team's new captain. I'll admit this is something I never put much thought into because I didn't think they would go with one of the young guys. But I would not be surprised to see this happen now. 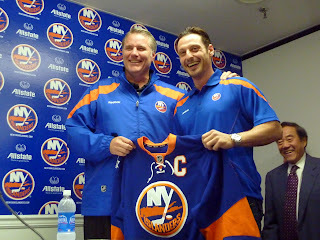 I'm still leaning towards wanting it to be someone like Mark Streit, but if the Isles plan on having Tavares be the captain down the road, then they may decide to get it over with sooner rather than later. Time will tell, and we'll find out tomorrow. For now we enjoy the news of the impending extension. Ten years. I can't believe how fast it's gone. It's amazing for me to think how time seemed to just slow down on September 11th, 2001. It was a feeling that is often difficult to put into words. Growing up, my parents always talked about one of the biggest events from their childhood - the assassination of President Kennedy - and how every detail of that day is still engraved in their minds. I never understood the magnitude of the stories they were telling me. For me, the day started off just like many other September 11ths had for the previous 13 years. It was a sunny day, with temperatures floating between that late summer/early fall range. Seeing as it was just the second week of school, the "beginning of the year excitement" was still there. Not to mention, it was also my first time in a new school as I had just began high school. Shortly after waking up, I was greeted by the voices of my mom, dad and brother singing "Happy Birthday" and received gifts and cards to celebrate the occasion. Little did I know what I was in store for on my first birthday in high school. Still in the process of getting acclimated and navigating a school much larger than what I had been used to for the previous nine years I was able to find my way to my second period class, Social Studies. This, ironically is the same class that Sean and I talk about on the show as the one we first became friends in. I sat in the second row from the door, first seat. Our conversation on ancient Asia was interrupted by the very shaky and unsure voice of our principal, explaining what was going on in Manhattan. Panic set in, and no one quite understood what was going on. We knew it wasn't good. My social studies teacher turned all different kinds of colors. It was his first year teaching, and you could tell how unsure he was as he tried to decide if it was better to continue with the lesson or just stop all together. He tried to continue. The way Northport High School is set up is a bit different from other schools. In the main part of the school is an area that students and teachers alike refer to as the "commons." This is where students can hang out, and it consists of TVs which usually have some kind of news broadcast on them. People surrounded the TVs that day. There weren't many classes that day as many teachers were too distraught to teach, so students congregated around the TVs to try and fathom what exactly was going on. Students were taken out of school during the duration of the day. My mother didn't come to get me out that day early, but did show up at the end of the day to pick me up. After talking with her for a few seconds, my attention immediately turned to wondering about the well being of my cousin, who worked on the 86th floor of the North Tower. I consider myself and my family very fortunate as he was called out to a meeting in New Jersey at 8:30 that morning. People always feel bad when they find out that I celebrate my birthday on 9/11, and their wishes often come with condolences. I consider myself fortunate to have not lost anyone close to me. Meanwhile, others have had their lives turned upside down. A birthday seems like small potatoes to me at that point. However, in 2001 it gave me a terrible feeling as it would for any 14 year old. Just like any good grandparents would do, mine called me as they always did every year to sing and wish me a good day. "Thanks," I said. "I completely forgot it was my birthday, actually. I didn't want fireworks on my birthday." Both my grandfather and grandmother tried to explain to me that the day was still special because I was born, and I had the ability to do special things as I move on in life. It's the same grandfather who's viewing will be today, on the 10 year anniversary of the attacks after passing away on Friday morning. There isn't a better person I can think of when it comes to who I want to spend the day with. I recently came across an interesting article on ESPN about the healing power of sports. While many will downplay it, I truly feel that time and time again it has been proven that they do. I was always an avid baseball fan, but spent that summer learning about hockey after going to my first Islanders game in December of 2000 and falling in love. I knew I wanted to be a super fan of the sport. For someone young, having entire leagues shut down temporarily just showed you what kind of magnitude this had. Unfortunately for some of my friends, that's what it took for them to get it. Sports served as the perfect distraction for New York that year. The Mets came back against their hated rivals in the Braves and defeated them in grand fashion in the first few days after play resumed. The Yankees went all the way to the World Series, leaving us with some really memorable moments from late October and early November. And the Islanders, who had been so bad for so long stormed out of the gate to an 11-1-1-1 record. They would finish with 96 points and a 5th place finish in the Eastern Conference. Sports brought everyone closer together in the days following the events. They gave a lot of folks plenty to be proud of and provided that distraction we all needed. It's these same sports that we can still enjoy thanks in large part to those who either died in the attacks or fighting overseas so we don't have to deal with something like this every again. For those who were affected by the tragedy, I offer my condolences and my thanks for the part that you're loved one played in me being able to sit here and write about a sport and a team I am so passionate about. The Islanders announced on Thursday their intention to induct four players - one from each decade of their 40 year existence - at upcoming games this season. The first Captain and goal scorer in Islanders history, Ed Westfall will have his ceremony on November 19th against the Boston Bruins as the rep for the 1970's. The 1980's rep is former defenseman and current Pro Scouting Director Ken Morrow, who will be honored on December 31st against who else, but the Edmonton Oilers. The 1990's rep is Pat Flatley and he'll be honored on January 14th against the Buffalo Sabres, while Kenny Jonsson rounds out the group, representing the 2000's on February 11th against the Los Angeles Kings. The Isles hadn't had any new inductions since Bob Bourne was installed into their Hall of Fame back in 2007. It's a nice touch to do this and try and hit on each decade while planning it around some teams that had significant meanings going against the Isles in those decades. In all honesty, it would not have made sense to put Morrow's night on any other aside from the game against the Edmonton Oilers. Sean probably knows more about the 90's than I would, seeing as I was more of what you would call a casual fan back then. But I know the 2000's intimately, and grew up for much of my childhood life only knowing of an Islander defense that included Jonsson. To say he was always under appreciated is an understatement, and that includes myself. It wasn't until I had a better understanding of the game when I appreciated more of what Jonsson had to offer. This was obviously magnified after the lockout ended and the Isles have had problems constructing a competent defense since. Are there other players who are more deserving? Absolutely, but I think for what they were trying to accomplish, it's a nice touch. None of these guys may have been the flashiest, but they absolutely were unsung heroes of their decades. Do I think it was a stretch trying to include someone like Jonsson? Yes and no. I think for the 2000's, he's a good choice - was a big part of the rebirth and as I mentioned, relatively under appreciated. In all honesty, there weren't many others you could make a case for. Times were lean for so long, and Jonsson came along and remained for a few years before things really got going again. He may not have been able to handle the captaincy, but I respect that he tried and then knowing his limitations, ultimately handed it off but still did his job more than adequately. In any event, a good move by the Islanders to honor some good players from the past, and cover each decade so as to reach out to all generations of Isles fans. More to come soon regarding noteworthy items from the summer, and some thoughts on the plane crash that took out all of Lokomotiv Yaroslavl. I've been working on a piece, but due to some family issues have not completed it. Just bear with me. Jay Pandolfo Comes to Training Camp, What About Others? The Islanders announced on Saturday that Jay Pandolfo has agreed to a try out with the team when camp opens in a couple of weeks. About a week ago, Newsday's Katie Strang posted a list of players who the club could possibly have in camp on invite: Pandolfo, Sergei Samsonov, Chris Clark and Bryan McCabe. There is strong reason to believe that all were extended invites - among other players as well - but so far, going this route only made the most sense for Pandolfo. Pandolfo hasn't been in the NHL since the 2009 - 2010 season with the New Jersey Devils. After that season he was bought out and participated in a handful of AHL games last season before his Christmas Day release from the Springfield Falcons. Neither Pandolfo nor the Islanders have anything to lose with this, and I'm disappointed in some of the comments I see from fans regarding this. The point of an invite is that it gives you a look at someone without having to give them a guaranteed spot on the roster. I want Nino Niederreiter, Matt Martin and others to feel their jobs are at stake and be pushed. Now, how far can someone like Pandolfo push them? Well that remains to be seen, sure. But with so many forwards already on the roster, if I'm a young player and I see a 36 year old veteran coming in, I'm not taking my chances or scoffing at the competition. Especially with an individual who has proven for many years he can be an excellent penalty killer, even though his game has eroded over the past two seasons. According to Strang, McCabe and Samsonov appear "reluctant" to take the invite at this time, and I can't blame them for that. With camps set to open, any injury could have them signing a guaranteed contract, perhaps for terms even better than they are expecting (see Mike Mottau and his two year deal from the Isles last September 25th). I would imagine the invites are always open, so Clark could still come if he wishes too, despite a similar player in Pandolfo coming (EDIT: Not sure how I missed this, but Strang reports Clark has accepted an invite with the Bruins, who offered one to Pandolfo too). I think as time goes on, McCabe accepts his invite too. Samsonov though, I would be surprised. I've been asked this a lot over the weekend - if McCabe comes to camp, am I upset? It's a good question. McCabe is not the ideal defenseman this team needs. But at the same time, that's why he'd be coming in as an invite. If he plays well? Then it means he looked fine, looked like he still had enough in the tank and will suffice until someone better comes along (or one of the kids are ready, such as Calvin deHaan). If he looks awful? Then he walks away and is free to talk to other teams (like Brent Sopel did a few years ago after his camp with Detroit). At the end of the day, an upgrade for me in the most basic sense was a guy more durable than Radek Martinek, Jack Hillen or Bruno Gervais. McCabe would certainly be that and a great shot to use on the 2nd power-play unit to keep the opposition guessing after seeing Mark Streit on unit one. I am always curious to see what players go on invites to other teams, and see who can crack lineups. It's a popular way to fill out rosters or find an extremely cheap gem. The Islanders generally have lucked out with guys like this under Snow, and it'll be a good story line to follow as a distraction from some of your usual ones. We'll see if any of the others accept soon. More to come on some items we missed on discussing while we were away.